Vermicomposting is the use of decaying food and vegetable matter, bedding materials and worm castings to produce fertilizer. Vermicomposting is the use of decaying food and vegetable matter, bedding materials and worm castings to produce fertilizer. Worm castings, also known as vermicast, are the end result of the material that a worm ingests. In other words it is worm manure. 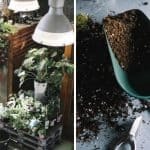 This end-product is easy to achieve and can be a great way to, not only, fertilize your garden and houseplants, but to reduce waste. The re-wiggler worms in your composting bin will produce a nutrient rich humus that can only come from nature. Getting started may be the most difficult part of vermicomposting. To begin you will need to assemble the necessary materials. These materials include a worm bin with a lid, bedding material such as shredded newspaper, a spray bottle for moisture, and worms. Vermicomposting can be done virtually anywhere. Worm bins are available for purchase or you can construct your own bin. They can be made of wood or plastic and must have a lid with ventilation. If you decide to use a bin that you have at home, that can work as long as it has never stored chemicals or pesticides of any kind. Drill several small holes in the sides and bottom for ventilation. Those do-it-your-selfers out there who choose to build their own bin must make sure they do not use any of the aromatic woods, such as cedar or redwood for building. Size is up to the builder but typically should be in the 8 to 12 inch high range. The reason for the height limitation is that composting worms tend to be top feeders. This depth is optimal for the worms. Bedding will be needed in the bin to get the worms started. There are a few choices as far as bedding material is concerned. Shredded corrugated cardboard, peat moss, and commercial bedding are all acceptable, but the easiest, and least expensive to find would be shredded paper. You can choose either newspaper or typing paper and the ink on the paper will not be a problem. Soak your bedding choice in water until it is saturated. When you are ready to put the bedding in the bin wring it out and then fluff to spread it out in the bin. Spray down the bin at regular intervals to keep the material moist but not drenched. Now it is time for the worms. You cannot just head outside and dig for common variety earthworms. They do not do a very good job of composting. The hands down best choice are red worms also known as red wigglers. Eisenia foetida or Lumbricus rubellus, are the best because they are able to reproduce effectively while in captivity. 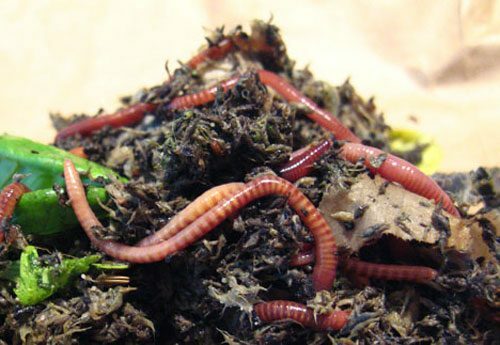 One pound of red worms are capable of eating as much as seven pounds of kitchen waste per week. Once the worms are in the bin you will start to add your kitchen waste. It is important to cut the food into small pieces because worms have no teeth. Feed your worms fruit, vegetables, cereals and grains. You can add tea bags and eggshells occasionally. 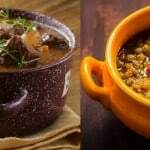 You will want to avoid meat, fish and oily foods as these will make your bin to smell. Do not feed the worms until you are sure that they are consuming what is already present in the bin. Keep the scraps covered with damp bedding material at all times. A coffee can with a lid stored under the kitchen sink will hold your waste until feeding time. Compost will be ready to harvest in approximately three months and the bedding material has turned a rich, dark color similar in texture to soil. You can begin using your compost when you have moved the worms aside so you can start over. Move all of the composted material to one side of the bin and add new bedding material to the other side. Just leave the bin alone for a while and the worms will move on their own. After all, they are going to move to where the food is. If you need a quicker method of harvesting you can dump the bin on a large plastic sheet and separate the compost into several piles. The worms will go to the bottom, so after a few minutes move the top layer away. After completing this action a few times you will replace your worms in the bin and you are ready to use your compost. Compost can be spread directly in the garden or mixed with water and sprayed on the desired area. 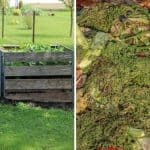 Vermicomposting is an easy and rewarding activity. It is good for the environment and good for you garden. 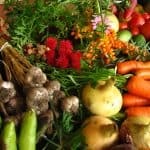 Whether you are at home in city apartments or vacationing at your summer houses you can harvest your “home-made”, nutrient rich humus to make your garden a beautiful healthy place. 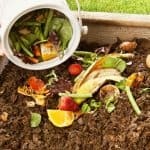 Composting With Worms: This comprehensive site will walk you through all the steps in starting your compost bin. Vermicomposting Resources: A list of resources including lesson plans, individual information and suppliers. Worm Away Your Scraps: A school guide to reducing cafeteria waste. Kids Pages: Fun information and games to get kids involved in vermicomposting. Science Fair Projects: A resource guide to vermicomposting and related activities for science fairs.